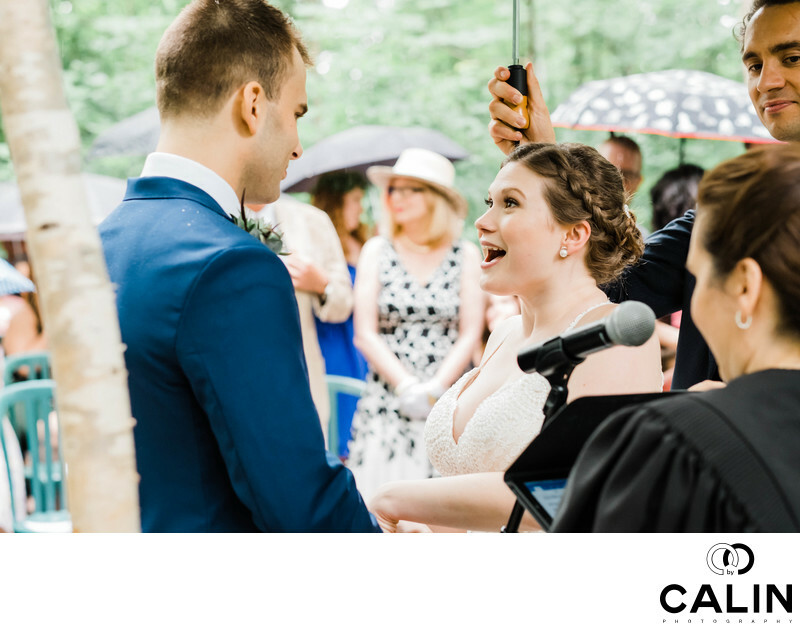 Photography is about capturing beautiful moments and this forest Kortright Centre wedding ceremony provided plenty of opportunities. Laughter's and the tears sometimes seconds apart loss to capture the love between the bride and groom and create beautiful imagery for the generations to come. In this particular photograph, we can see the bride laughing while she seeing her vows. As a Toronto wedding photographer, I learned not to get too involved in the wedding but rather observe it as a spectator in order to document it properly. As such, I cannot remember what triggered the beautiful bride's reaction. To photograph this image I stepped behind the bride and groom so I can see them and their guests in the background. Telling two stories simultaneously makes a picture stand out. On the left of the photo we can see the groom paying attention to his bride we seen her vows. She is framed by her husband to be, brother-in-law and the officiant. There are several layers in this shot that gives it depth. In the foreground, slightly out of focus he can see the officiant. In the middle ground, the subject of this picture, the writing room are the imperfect focus while in the background we can see the guests and families enjoying the outdoor ceremony.